No matter their industry, all businesses can benefit from digital marketing — from business-to-business software companies to online clothing stores, and from mega corporations that are household names to mom-and-pop stores, whether they’re online only or brick-and-mortar stores. But the world of digital marketing is constantly changing. While this field may rapidly be evolving, many of its core principles remain the same. This Cheat Sheet examines and explains many of these digital marketing tenets. For ice-cold prospects (people who have never heard of your brand before or are unaware of the products or services that you sell) to become customers, they need to travel through the stages of awareness, evaluation, and conversion, and you need to create content that facilitates their movement through each stage. Awareness: Prospects first need to realize that they have a problem and that you offer the solution. If people don’t know that they have a problem, they don’t seek a solution. To create awareness, clearly define what problem your products or services solves and then create content, such as blog posts and YouTube videos, to make people aware of the problem and the solution you provide. This content moves your prospects to the next stage. Evaluation: In this stage, people evaluate the various choices available to them, which can include making a purchase with you, buying your competitor’s solutions, or doing nothing to solve the problem at this time, if ever. To move people through this stage, create content that helps them make decisions, such as product demos that show your product in action and product comparisons that compare the benefits of your product to that of your competitor’s. 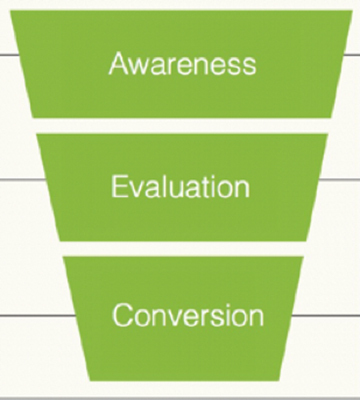 Conversion: Prospects are now at the moment of truth: purchase. For this stage, design content that overcomes any hesitancy people may have about buying from you. For instance, create content that clearly defines your return policy, make product detail pages that convey the schematics of your product or service, and include customer testimonials that speak to the success and the quality of your product. Social media marketing is made up of four equally important parts, and each of these activities meets very different business goals, as shown in the table that follows. Social listening: Monitoring and responding to customer service and reputation management issues on the social web. Social influencing: Establishing authority on the social web, often through the distribution and sharing of valuable content. Social networking: Finding and associating with authoritative and influential individuals and brands on the social web. Social selling: Generating leads and sales from existing customers and prospects on the social web. To get results from social media marketing, first determine the goals you want to achieve. Then focus time, money, and effort on the corresponding social media activity. For example, if the company goals are to manage reputation and reduce churn, the focus should be on developing a strong social listening program. When running paid traffic campaigns on advertising platforms like Facebook, Google, Twitter, or LinkedIn, you’ll have no shortage of data at your disposal. And thanks to its nature, digital advertising is infinitely more measurable than its counterpart in the offline world. Cost per acquisition of customer (CPA): The amount of advertising spend divided by the number of customers generated. Drill down on this metric by calculating CPA by traffic campaign, traffic source, and more. Cost per lead (CPL): The amount of advertising spend divided by the number of leads generated. Drill down on this metric by calculating CPL by traffic campaign, traffic source, and more. Click-through rate (CTR): The number of clicks divided by the number of impressions on an ad and any other call to action. The higher the click-through rate, the more prospects you will be moving from stage to stage in the customer journey. Cost per click (CPC): The amount of advertising spending divided by the number of clicks on the ad, ad set, or ad campaign. Although the click-through rate (CTR) and cost per click (CPC) are important metrics to monitor, they are not as important as your cost per acquisition (CPA) and cost per lead (CPL). After all, if your lead, customer acquisition, or both costs are within the range of profitability, a low click-through rate or high cost per click becomes less important.